10 + 10 = ? : (Required) Please type in the correct answer to the math question. This was not one of the most exciting days on the trip. We had to wait 4 hours in Amarillo to get the 40,000 mile oil change done. I had called the Dodge Sprinter dealer, but he couldn't handle such a high vehicle, but said the Chevrolet dealer could do it. We made an appointment for 11 but when we arrived at 10:30 he couldn't do the job until 1:00pm. It was a huge Chev Truck parts and service operation, but seemed to have very little business. We were underway at 3:15 with 150 miles to go. 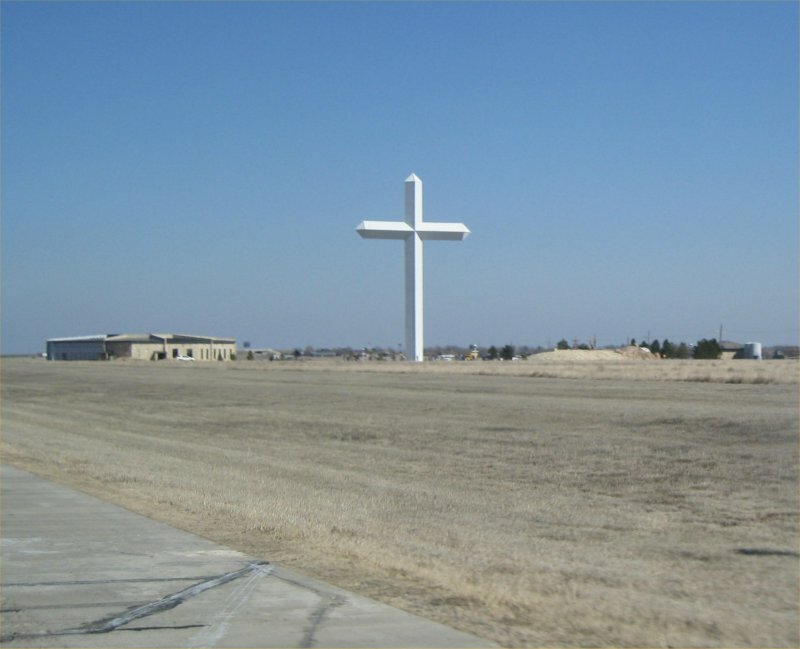 Near Groom Texas in the Panhandle we passed the tallest cross (190 feet) in the Western Hemisphere (see photo). It could be seen for 5 miles on I-40. Checking on the web, it is now the second tallest as a new cross in Illinois tops out at 198 feet. Did you know that Elk City Oklahoma was the home of Miss America 1981? That's what the sign says. It turns out that Clinton is the location of the Route 66 Museum. We'll visit there first thing in the morning and hopefully buy a copy of the Route 66 map you need to follow that road.